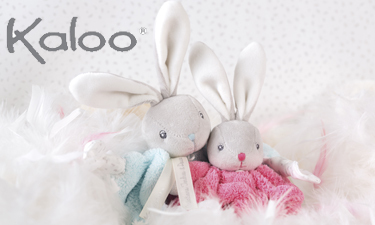 Celebrating 20 years in 2018 since its first creation, Kaloo offers a French-style passion to its incredibly soft and charming plush toys alongside a high specification of quality and presentation. The brand’s ethos derives from the essence of a hug in its reassuring pleasure that creates a feeling of well-being and hence its importance for children’s proper sensory and cognitive development. Kaloo, defines itself as “Gentleness Creators” and aim to fulfil this natural need for tenderness, love and comfort through its products. It combines perfectly classic shapes with innovative fabrics, textures and colours, creating some timeless as well as forward-looking collections. The quality of the products and the comfortable, tactile materials are what makes Kaloo so special and its creations such faithful companions. Baby Brands Direct is delighted to offer retailers supply of Kaloo, a universe of gentleness that is generous, soothing and filled with precious moments of tenderness.